Today I sent an email to the Wesleyan family with an update on our progress in meeting the goals set out in our framework for planning Wesleyan 2020. You can find the link to the current update here. The update is organized under the rubric of our three overarching goals: Energize Wesleyan’s distinctive educational experience; Enhance recognition of Wesleyan as an extraordinary institution; Work within a sustainable economic model while retaining core values. Over the last 12 months we undertook a major self-study as part of the regional Accreditation process. I don’t explicitly discuss that process in the update, but I can say we were very pleased with the first response of the Accreditation Committee that came to campus. We will be releasing the official Accreditation materials when they are available in 2013. Over the last year we have been involved in extensive (and sometimes intense) discussions with faculty, students, alumni and staff about our present operations and our plans for the future. This is as it should be. Receiving the most attention so far is the change in how we will budget for financial aid (leaving us about 90% need blind), and in this update I review the rationale for the change. Affordability, accessibility, and financial aid are key challenges for Wesleyan, and in the fundraising campaign we are launching, financial aid endowment (complemented by gifts to current scholarships through the Wesleyan Fund) is our highest priority. We also added a button to the homepage that makes it easier to direct donations to financial aid. The site also collects links related to our conversations concerning financial aid and the university’s economic model. As classes end and finals approach, campus life is in its end-of-the-semester mode. Study and practice spaces are full, and creative energies are being unleashed. Professors are holding extra review sessions, and expectations for strong performances to close out the semester are running high. Artists are planning exhibitions, scientists are conducting experiments…data is getting crunched, and wild interpretations are being molded into forms that will seem powerfully compelling. This is why (well, some of the reasons) we love to be here. It’s almost the end of the fall term. The work will get done! This past weekend the trustees were in Middletown for their annual retreat. Our theme this year was “the innovative university,” and we worked together to think through how Wesleyan might get out in front of some of the major changes in higher education. Technology, of course, is driving many of these changes, as is a strong desire (for many) to lower the cost of education while making it more vocational. In this context, how could Wesleyan preserve and build upon some of its great traditions of scholarship and learning while also creating opportunities for new modalities of education in the future? How do we expect student learning and faculty research to change over the next decades, and in what ways can Wesleyan contribute to making those changes as positive as possible? These were some of the broad issues the Board discussed with faculty, staff and student representatives. 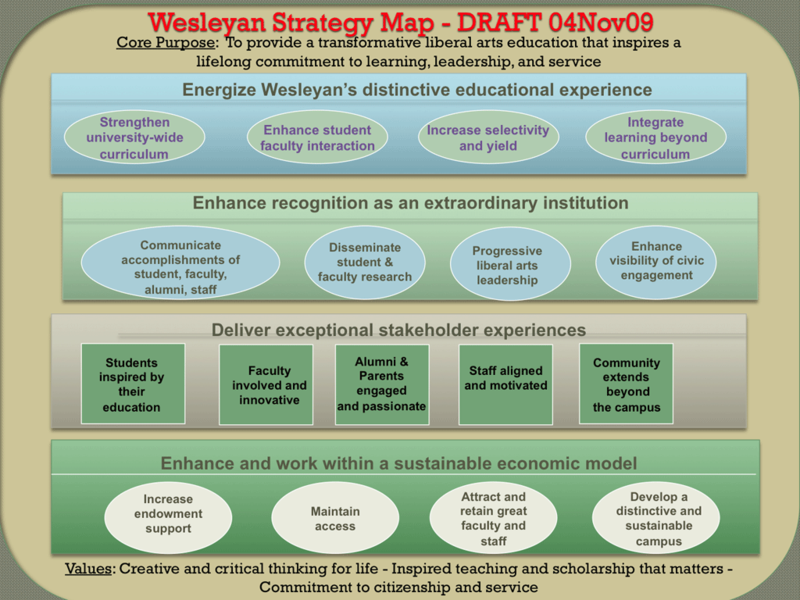 We have been using Wesleyan 2020 and a strategy map that complements it as a framework for allocating resources and planning the future of the university. We have three overarching goals that animate all our other objectives: to energize Wesleyan’s distinctive educational experience; to enhance recognition of the university as an extraordinary institution; to maintain a sustainable economic model. At the retreat we talked about a number of possible innovations that would be “disruptive” — that would change the platform for the educational experience of students. These ranged from significantly changing the time to degree, to collaborating with other institutions for joint programs, to adding many more online opportunities to our curriculum. I am particularly interested in how we can contain the cost of a degree while simultaneously offering every student opportunities to participate in the arts, athletics, internships, and independent research. There is no doubt that doing all this while maintaining our capacity to support original work by faculty will be especially challenging. But it is a challenge we take on because of our belief that the deepest educational experience depends on the scholar-teacher model. 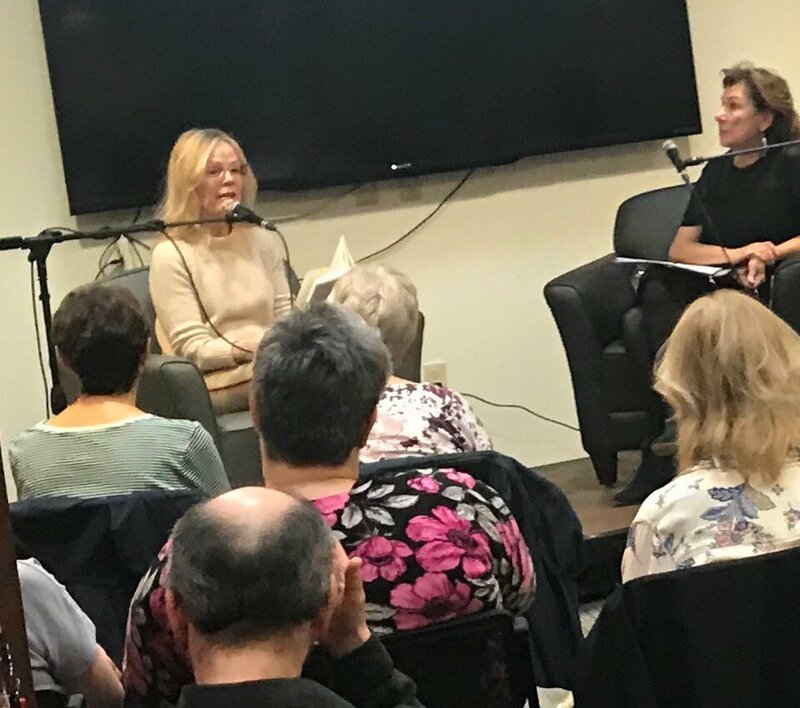 Like many of the trustees, faculty, and students present, I left the meeting thinking that the urge to streamline education to meet some imagined vocational standard was a big mistake. At many other institutions, under the guise of “innovation,” calls for a more efficient, practical college education are likely to lead to the opposite: men and women who are trained for yesterday’s problems and yesterday’s jobs, men and women who have not reflected on their own lives in ways that allow them to tap into their capacities for innovation and for making meaning out of their experience. Under the pretense of “practicality” we are really hearing calls for conformity, calls for conventional thinking that will impoverish our economic, cultural and personal lives. Hearing the passionate dedication of our trustees, I felt energized to rethink how we might change Wesleyan while remaining true to its core values. The mission of universities focused on liberal learning should be, in Richard Rorty’s words, “to incite doubt and stimulate imagination, thereby challenging the prevailing consensus.” Through doubt, imagination and hard work, students “realize they can reshape themselves” and their society. At Wesleyan, we recognize that challenging the prevailing consensus can actually enrich our professional, personal and political lives. The free inquiry and experimentation of our education help us to think for ourselves, take responsibility for our beliefs and actions, and be better acquainted with our own desires, our own hopes. Our education contributes not only to our understanding of the world but also to our capacity to reshape it and ourselves. That may be the most profound innovation of all. In the spring of 2009 I had extensive discussions with faculty, students and staff about the distinctive aspects of the Wesleyan experience, and then I spent the summer developing a framework for strengthening these aspects. 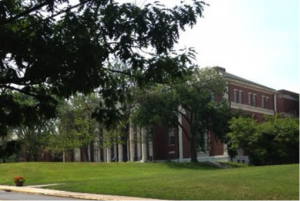 In the fall of 2009 we posted Wesleyan 2020: Preliminary Reflections on Planning. Since September, responses and suggestions have been coming to us regularly from faculty, staff, students, and alumni — mainly through a number of fora and other meetings devoted to discussion of the plan. On the basis of these discussions, we have a revised document Wesleyan 2020: A Framework for Planning which is posted below. As a “framework for planning” it is not so much a checklist as a flexible paradigm to guide our decision making. It will doubtless engender more responses in the future, and we are prepared to revise it as a “living document.” I hope that the trustees, who have been deliberating on the goals and strategies in this plan for some time, will agree that this revised document broadly reflects the ideas of those who care about the future of our university and that it will help us make the right decisions going forward. To all of you who responded to Wesleyan 2020 formally or informally, directly or indirectly, I express my thanks. To all who care about Wesleyan, I look forward to your help in building Wesleyan’s future. As January is coming to an end, I am writing this on a plane back to Connecticut from Texas. I’ve been in Houston and Dallas the last couple of days, meeting with alumni, parents and even a few pre-frosh. When I began my presidency in 2007, we increased our communications efforts in areas of the country where Wesleyan wasn’t as well known as it is on the Coasts, and we placed a special emphasis on Texas. We have many alumni there who work in the technology, education, medicine and energy fields, to name just a few. We’ve held well-attended events in Houston and Dallas the last two years, and this week’s gatherings were energetic and popular. The Roff family, our host in Houston, has had six family members at Wes, and the Barth clan there can count seven! We discussed the planning framework, Wesleyan 2020, in both cities, and even the torrential rains in Dallas didn’t dampen the high spirits at the reception hosted by the Wolins (P ’12). I was pleased to report that in the last three years we have tripled the number of applicants from Texas. This is one chapter in a very impressive admissions story. Last year applications were way up, and so a reasonable person might have expected some pull back from these numbers in 2010. But the application pool has increased again, this year by about 6%. That means that our pool has grown about 30% in two years! Most important, the quality of the pool is very strong, and we are meeting our goal of increasing geographical diversity. Early decision applications are at an all time high. It’s a tribute to our community that so many talented people want to be part of it! Why are so many more people applying to Wesleyan? It isn’t easy to point to any specific factors with confidence. Clearly, we have benefitted from positive press thanks to the great work of our faculty, students, staff and alumni. Our admissions and communications departments have been in high gear making sure that we get the word out about what makes Wesleyan an extraordinary institution. The campus looks great, and investments in our physical plant have had compelling results. We have been emphasizing some of the distinctive aspects of a Wes education, and above all, students and their families have been talking to others about their own experiences. Enhanced recognition is important not only because it allows us to put together ever more diverse and talented classes, but also because it increases the value of Wesleyan diplomas for all our alumni. We don’t need to “sell Wesleyan,” or develop some slick marketing messages. After all, by emphasizing our distinctiveness we are also saying that Wes isn’t for everybody. The culture of openness and experimentation, exuberance and achievement, creativity and focus…this culture is different from the ones that have developed at other fine schools. We want to get the word out, but we don’t need to present ourselves as just another highly selective school for successful high school seniors. Now that we have well over 10,000 applications for next year’s class, the admissions staff has to read each one of them with the time consuming care that comes with a holistic application process. I thank them in advance for all the hard work that will go into putting together the class of 2014!